Home Cast iron cookware We share with you some benefits of cooking with cast iron. What are the benefits of cooking with cast iron cookware? Are you thinking about replacing your old non-stick pan? Why not consider cast iron cookware. We think they are great kitchen all rounders. If you’re new to cast iron cooking you may want to know the benefits of cooking with cast iron cookware. There’s good reason cast iron cookware has been the favourite in so many households over the years. In this article we discuss some of the benefits of using cast iron cookware. Although there are many types of cookware, cast iron still reigns supreme in the kitchen. At Boonie Hicks we really enjoy our cast iron cookware. We think no kitchen is complete without a couple of pieces. Like anything there are a few pros and cons. However in this article we have the lucky job of introducing some of the benefits of cast iron cookware. Before we get carried way, lets take a look at a few disadvantages first. What are the disadvantages of pre-seasoned cast iron cookware? Cast iron is heavy. It can be a good work out especially the big camp ovens. If unseasoned, cast iron can rust. It doesn’t hurt to wipe the cookware with a little oil before storing. It’s not dishwasher safe. Dishwashers are so good, they will clean off the protective layer that prevents rusting. Acidic food such as stewed fruit can react to the iron pan, tainting the food. It’s not the best prolonged water boiling. They used to do it back in the day when there were few options available. However now there are other materials better for boiling liquid. Please keep in mind there are pros and cons of cast iron just like all cookware. In saying that we hope you enjoy using your cast-iron cookware as much as we do. There are two types of cast iron cookware available pre-seasoned and enameled. At Boonie Hicks we use both. Pre-seasoned and enameled cast iron cookware. In this article we will focus on pre-seasoned skillets and dutch ovens. Of the two, pre-seasoned cast iron cookware is still more popular than enamelware. 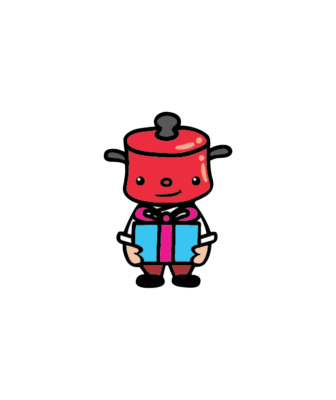 Although enameled Dutch ovens are becoming more and more popular. Each will have some different benefits. We cover the benefits of enamel cast-iron “here”. 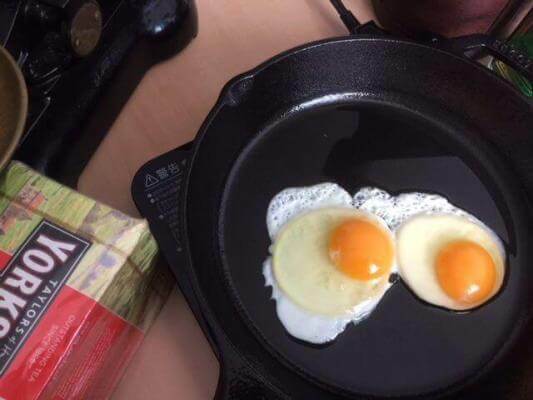 Please do you research before buying enameled cast iron cookware. Before we get in to “what are the benefits of cast iron cookware”. Just a quick note on enameled cast iron. Enamelware offers benefits that pre-seasoned cast iron doesn’t have. However we recommend buyers to be more choosy because of varying quality. There are so many manufactures jumping on the bandwagon on the enamel tend. Unfortunately a lot of their products are substandard and many users are put off cast iron. If you want to learn which type of cast iron cookware is better for your needs then click the link for another one of our articles. It’s great that cast iron cooking is making a resurgence however the quality of many of the products are questionable. We think it’s better to do a little research first. Ive seen chipped skillets and Dutch ovens in shops. I’d hate to think how easy they can be chipped if they’re already damaged before leaving the shop. If your looking for a pre-seasoned pan you’re spoilt for choice however at Boonie Hicks we are huge fans of Lodge pre-seasoned cast iron. Benefits of cooking with cast iron. 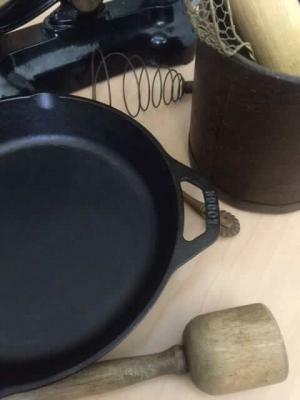 Cast iron cookware uses natural materials. Both new and vintage pans look great and last a long time. The cookware can be used for many cooking methods. Cast iron cookware is pretty much unbreakable. Cast iron has huge thermal density. 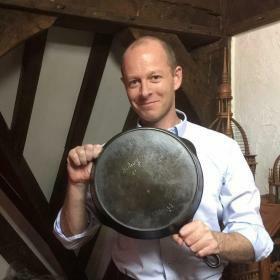 Why does cast iron cookware still reign supreme? Our recommendation for new users to cast-iron is a skillet. A cast iron skillet is really has no equal for versatility. It’s really great pan to have in your kitchen. Like anything there are pros and cons, however as cast iron enthusiasts we would like to share with you some benefits of using cast iron cookware. If you’re a first time user you’ll be surprised how easy they are to use. Unfortunately there’s a bit of a misconception that cast iron is difficult to use. It really isn’t but I can tell you what it is and that’s a whole lot of fun. Your cast-iron cookware will bring out the hippy in you. Iron is a natural material not synthetic. Pre-seasoned cast-iron uses no chemicals or dyes. No plastic is used, well in the good makers. I would avoid cast-iron with a plastic handle. Foundries can recycle defective pans. Cast iron cookware uses iron from other recycled sources. Using a cast iron cookware can last many decades. Okay, we are already at 6 benefits and we haven’t really started. Lets get stuck into a few more. At Boonie Hicks we really find cast iron to be quiet beautiful. They look wonderful on display, it’s useful and lasts forever if cared for. Using a cast iron skillet or Dutch oven may bring back many happy memories from your camping advantages or family meals as a child. It’s wonderful when many of the older pots and pans are passed on to family members to treasure. Vintage cast iron is considered much better than newer pieces because the manufacture was slightly different. The older cookware has smoother finish to what is mostly available today. So if you have inherited any cast iron from your parents or grandparents, make sure that you hold onto them. If by any chance you happen to come across them at garage sale have a quick check of the maker some of the older American pans are amazing quality and are true collectors items. But take care there’s lots of pans out theres is no need to rush. Research carefully if you’re just getting into collecting or choosing your first piece of vintage cast iron. Vintage cast iron is great but requires a little research, there’s also some great new pans and they’re sold everywhere. 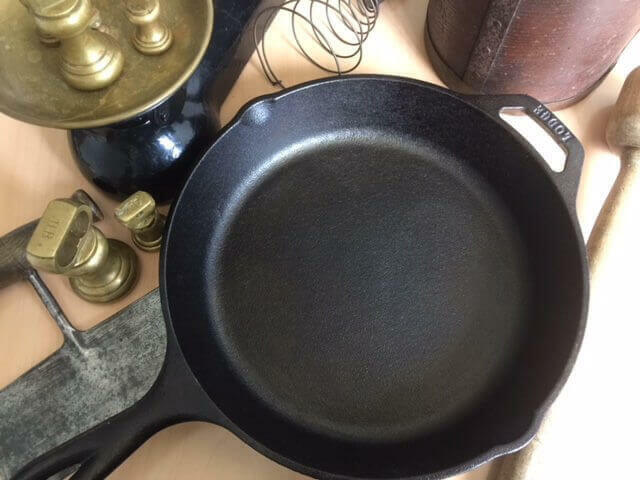 Bare or pre-seasoned is usually a lot cheaper than enameled cast iron and some the vintage pieces. You can also pick up new cast iron cookware pretty much everywhere. I wouldn’t go too cheap, Ive seen unseasoned pans for sale and they have really rough cooking surface. At Boonie Hicks we are huge Lodge supporters. they make pre-seasoned cast iron cookware and it’s great quality. We really don’t think you can go wrong with them. What are the benefits of cooking with cast iron cookware? Lets have a look at the most used piece of equipment in the kitchen. The cast iron skillet. Yum. We are first to admit we are not professional chefs, however a skillet it a great piece of equipment. The best thing is you don’t need to be a professional chef they’re easy to use and you can do so much with them. It’s little wonder why so many people love their cast-iron. Another benefit of cast iron is the material has huge thermal density. People often confuse this with thermal conductivity. With thermal density the cast iron remains hotter for longer. perfect for Mac and Cheese that would otherwise go cold on the table after five minutes. Some more benefits of using a cast iron skillet. Cast iron has been around for a long time, we are talking more than 2,000 years. 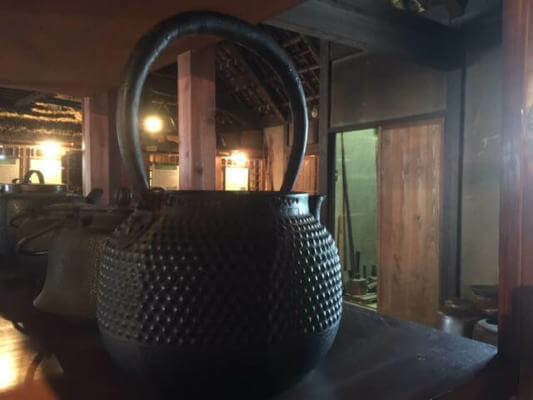 Historians suggest that people have been using cast iron as early back as the 3rd Century in China. Since then people from all over the world still use cast iron as their cookware of choice. 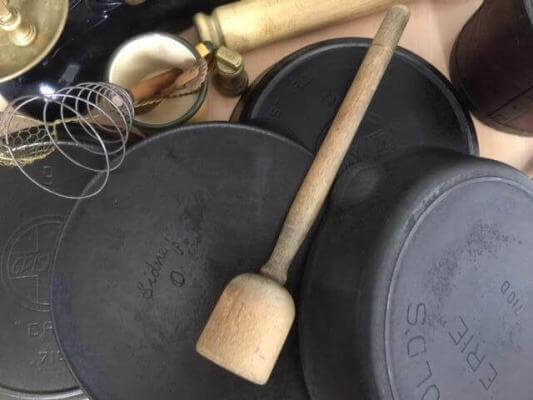 Here’s a nice little article on the evolution of cookware. They are sturdy and extremely durable. Cast iron pans are heavy, which also implies that they are durable as well. Although they tend to rust when they are not well cared for. However if the cookware is seasoned and stored when dry, it can serve you for more than a hundred years. 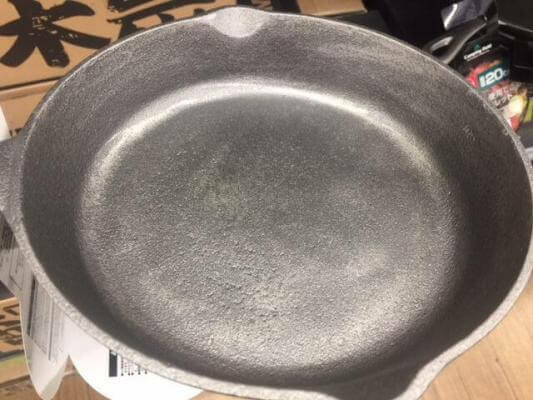 Some cast iron, particularly unmarked vintage ones that are found commonly in garage sales, can be easily 80 years old or more. Additionally, most cast iron, the high-quality ones at least, are made using one piece of metal. The use of one piece of metal ensures that your cast iron does not damage easily. If you ever come across a cast iron skillet you may have yourself a bargain. Vintage cast iron partially skillets have become very collectable and can command a healthy price. Like all collectables it’s important to do research before investing. If you’re at a garage sale and see some vintage cast iron. One of the bigger factors to the value would be if the pan has any wobble, side to side rock or if it spins on a flat surface. If you are health conscious or adopting a healthier lifestyle, you may want to consider cooking with a cast iron skillet or dutch oven. If you want to know “why use a cast iron skillet?” there’s so many reasons for one, cast iron naturally allows you to cut down on your oil use. This is because it is more non-stick and releases food better than stainless steel. When using cast iron, all you have to do is preheat the iron and add a small amount of oil in the pan. A small thin layer of oil on the surface is all that you may need. Stainless steel often holds into food more so more oil is required to avoid hard scrubbing later. This of course cancels out if you’re deep frying. Remember we a not medical practitioners we just love our cast iron. Please contact a nutritionist or medical doctor for trained advice on healthy cookery and nutrition. Another benefit of cast iron cookware is that it’s more non-stick than stainless steel and enamel cast-iron. The seasoning on the cooking surface gives your pots and pans the non-stick surface. Well at least more non-stick than stainless steel. You can easily season a piece of cast-iron cookware. It sounds difficult but it really isn’t. These some great videos on the internet how to season cast-iron. Some are quite funny but there’s many great videos out there. If you buy vintage cast iron we recommend putting on a new seasoning. 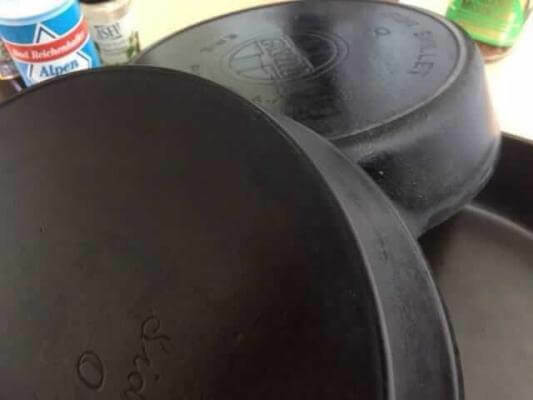 You never know whats been cooked in your cookware before you, so we think it’s best to take off the old seasoning back to bare metal. Then put a nice new layer of seasoning onto your vintage cast-iron. If you do not want to season cast iron cookware yourself, you can buy a pre-seasoned cast iron skillet or dutch oven from reliable brands like Lodge. Lodge have the benefit of putting on a seasoning at a much higher temperature than we can using home ovens. They can withstand high heat. Cast-irons ability to withstand high heat is one of the primary reasons why cast iron cookware is the best to use for all types of cooking. This means that they can be utilized on all temperature ranges. Another benefit to withstand high heat is that the cookware can be used outside for outdoor cooking. A camp oven can even on hot coals without any fear of damage. The capacity to withstand high temperature also means that cast iron skillets can be used for searing, sautéing veggies, as well as for deep and shallow frying. The high heat leaves a crispy layer on the outside without making the food mushy or dry in the center. Cast iron ensures that your food is cooked evenly just warm up your cookware first. People are usually advised to preheat cast iron cookware before cooking. 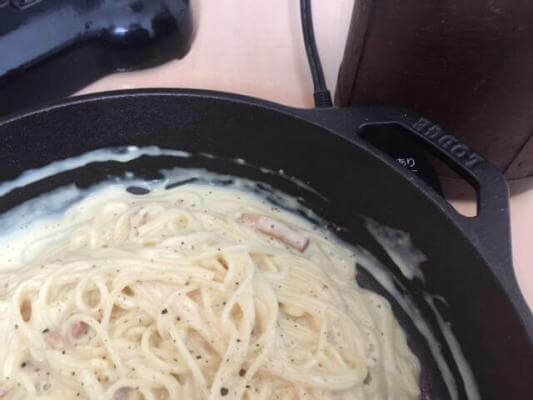 If you were to start cooking with your cast iron immediately without pre-heating, the chances are high that your food will get burnt in some places. The conductivity of cast iron is poor compared to other materials such as copper or aluminum. Even stainless steal is a poor conductor that’s why aluminum often sandwiched between two or three layers of steel. These pans come at a much higher cost than regular stainless pots and pans. Cast iron cooks evenly however it needs preheating first. You can avoid hot spots and cook your food evenly if you pre-heat your cast-iron cookware on a lower temperature before cooking. It’s slower to bring to temperature, however cast iron has amazing thermal density. It is a key benefit of cooking in cast iron cookware. Thermal density is also what helps to ensure that your food cooks evenly and remains hot. Unlike other cookware that has been constructed with other materials such as stainless steel, heated cast iron allows food to cook heater off the direct heat source. With thin pans food is just a few millimeters from the heat source and meals can burn quickly. Cast iron more foregiving than other cookware. This is why chicken that has been cooked in a cast iron is usually cooked evenly and often more tender. Cast iron cookware is relatively easy to maintain. Cast iron can survive years of continued use without cracking or rusting. Just remember to keep a layer of seasoning on your cookware and avoid the dishwasher at all costs. 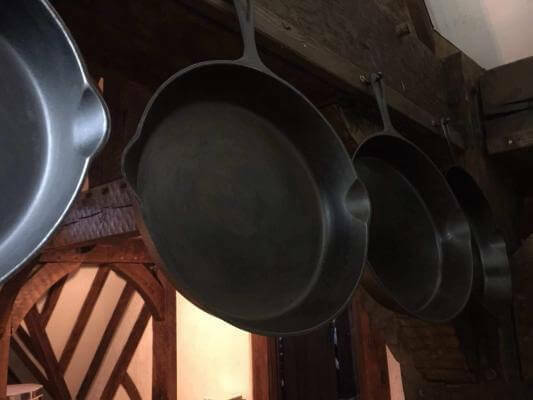 Some of these old vintage pots and pans have been found in barns and under houses and after a bit T.L.C many of fine old timers are ready to cook with again. They really are build to last. It is inexpensive and theres lots of choice. A great benefit of cast iron cookware is you are not restricted to a couple of leading brands. There is a wide range to choose from. I would still go with a company you’re familiar with. Our other advice would be to make sure the cookware is seasoned. Without seasoning, it maybe really rough to handle. This seasoning also gives a protective layer to the cookware and prevents rust. I’ve seen some great Dutch ovens sold by camping brands that look top notch. Of course our favourite is Lodge. We have Lodge products and they are simply fantastic. What are the benefits to cooking with cast iron cookware? We think we have covered some of the main benefits of cast iron cookware. If you use cast iron cookware we hope you get as much joy from it as we do. If you’re thinking about cast iron go on why not, We think you’ll have a new favourite piece of kitchen equipment. Previous articleWhy use a cast iron skillet? Here are some great reasons. Next article8 reasons why we choose Emile Henry cookware.